This novel picks up where the previous one left (if you haven’t read it yet, stop here), or roughly, after Emily Lovecraft and Daniel Carter, alogn with Detective Harrelson, have been stranded in the Unfolded world for a few months, slowly adjusting to their lives in Arkham-instead-of-Providence. And it’s not easy, because even though the Unfolded world is fairly similar when it comes to daily life (and better, in some ways, as in when Emily realises she own a nice house here instead of renting a flat), in many other ways, it is tremendously different. For starters, World War II ended much sooner, when the Third Reich dropped an A-bomb on Moscow in 1941, obliterating its whole leadership; and the Reich is now one of the world’s superwpoers, having been accepted because, well, the Holocaust didn’t concerned Jews but Communists, and for some reason this was much more acceptable to the West who turned a blind eye and ha-hemmed in a corner while it happened. Which infuriates Dan and Emily just as much, a different kind of evil still being evil after all; also, the Nazis are welcome in the USA and racism much more prevalent, so the Unfolded world isn’t so peachy for Emily herself. The world is definitely not right by our heroes’ standards, who want nothing more than bring back its Folded version, but have no clues where to start… until Emily finds out she has the Necronomicon in her safe, Henry Weston is at his shenanigans again, and Daniel gets hired to spy on a joint German-US project in Miskatonic University. Weird stuff ensues, veering into spy-thriller-weird more than HPL-weird at first, but no worries, the latter is never too far behind. Although I was hesitant at first about the spy thriller part, probably because of its apparent simplistic aspects (US vs Communists or US vs Nazis, it’s kind of the same... also Nazis make easy enemies: Instant Evil! Just add water! ), the way it was handled was all in all interesting, in part because, let’s be honest, it makes for contrived enemies… but it also makes for entertaining scenarii. In fact, it reminded me of the Call of Cthulhu/Adventure! Crossover RPG I had played a few years ago, as well as of Indiana Jones movies, and I soon found my bearings again in that kind of plot and setting. We get typical but useful ingredients: scientists working on a secret project infiltrated left and right by Gestapo, Abwehr and probably a few others (Daniel even manages to throw the CIA in all that, and it blends in perfectly); research influenced by esoterism; evil cultists who’re all the more evil because they treat sacrifice as if it was a mere bureaucratic matter; a secret research facility on a remote island in the Pacific Ocean; not exactly human beings; and this mix works fairly well here. 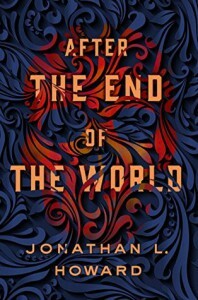 Conclusion: 4 stars, it was an enjoyable read in spite of the few peeves I had about it, and I breezed through it, and now I want the next instalment.